I had heard the rumours of bike lanes and sidewalks on East Saanich Rd., so when I learnt that North Saanich was hosting an open house to display the plans, I decided to check it out. The open house took place over three hours in room just off the lobby in the Panorama Rec. Centre. With 60 people trickling through over the course of the evening, it was well attended event, always good for getting as much feedback as possible. On hand to answer questions and take comments North Saanich engineering staff, engineering staff from Declan, the consultant, as well as Councillor Peter Chandler. 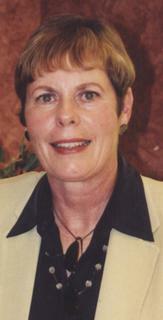 Mayor Alice Findall also stopped in for a few moments in the early parts of the evening. Outside the map room was the People for a Pedestrian Dean Park, a group seeking to make the Dean Park neighbourhood safer for walkers and bikers. 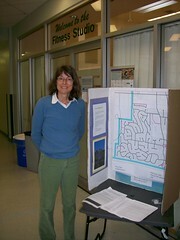 Suzanne Mophet, who founded the group, had setup a large board with a map of the neighbourhood and was asking people about where they would like to see pedestrian paths, sidewalks and other amenities. She and I ended up having a long conversation about the challenges of traffic calming in the newer suburbs, especially with regards to getting political and popular support. While I got a sense during the night that most people were supportive, I was confirmed with I spoke to Baohua Duan, one of the North Saanich Municipality’s engineering techs the next day. She is responsible for compiling all the myriad feedback from the 37 response forms. She confirmed that the overwhelming impression was very positive. All in all, it was a very well run event. Kudos to North Saanich for giving the public the opportunity to give feedback. The Declan and North Saanich engineering staff were great at answering nearly any question and having a councillor on hand was a nice bonus. I am looking forward to early fall when all the construction (North and Central Saanich) should be done. I will be at the East Saanich Rd. bike lane project Open House tonight. 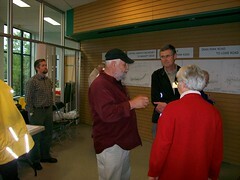 It is being run the Municipality of North Saanich and is being held at the Panorama Rec. Centre and runs from 5pm to 8pm. On hand will be North Saanich engineering staff to discuss the proposed plan. This project ties into a similar Central Saanich project that was funded by the Federal and Provinicial governments (press release – PDF & LocalMotion projects page). According to this news story, the work on that should start in June and be done by October. Maddeningly, I couldn’t find any information about Federal gov. money in the North Saanich portion. The above linked LocalMotion page lists $361,284 of Provinical money, which is cost shared 50/50 with the municipality. Regardless, this is a much needed project. 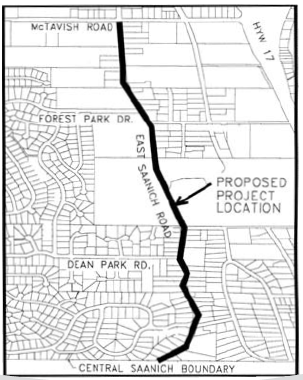 It provides yet another north-south route to complement West Saanich Rd. and the Lochside Trail. Hope to see some familiar faces there! While on a random web search the other day I came across the blog of Cairine Green, one of councillors for the municipality of North Saanich.While this might not be the only councillor in the CRD who is actively blogging, I certainly don’t know of any others. It is sad, really, as the web offers such an immediate way to get feedback and tell residents what is happening in their municipal government. Here is Oak Bay our website isn’t even that great (I have promised Chris Causton some info on how I think it should be fixed, something I haven’t yet delivered. One of these days..). None of the sitting councillors have active websites and most didn’t even have websites in the first place. The sole exception was Tara Ney, whose site is blank. Amongst the candidates, Michelle Kirby‘s and Chris Smith‘s sites have nothing more than thank you notices. Michelle can be excused, as she continues to blog at chezkirby.ca. Beyond our little sleepy neighbourhood, a quick survey of the candidates campaign sites show a mix of blank, no longer registered or simply rotting away with old content. I didn’t spend the several hours it would have taken to google each one of their names, but I can guess the result: nothing. Even further afield, the Toronto City Clerk has pushed council to enter the 21st century. They not only have a blog but even have a twitter account, TorontoCouncil. Both post near-real time or extremely fast updates on what is happening at council meetings. Have you found another blogging councillor? Please leave me a comment to let me know so I can add them to the sidebar.